I plan on attaching the other edge of the cartridge pleating further up the inner bodice. 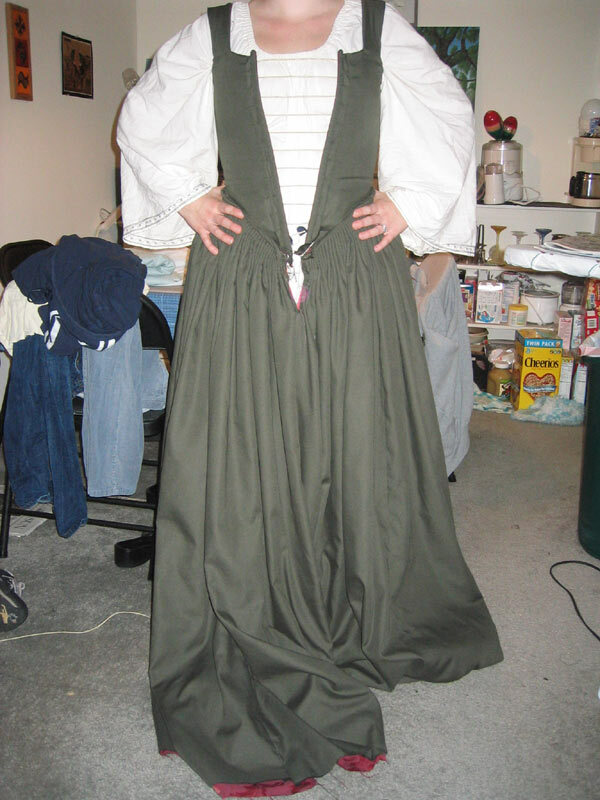 This will keep that folded edge flush on the bodice, and I think will provide skirt lift. If not, it will just mean lots of extra hand stitching, but that's okay--it'll be sturdier. 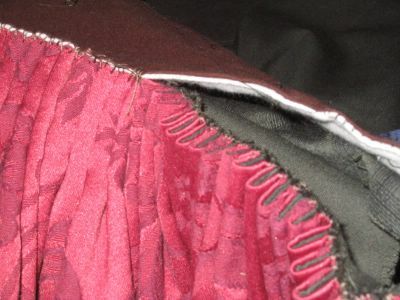 Its all about the learning.... Once the skirt is fully attached , I will sew the outer bodice edge down for a clean finish--no doubt this will be hand sewn too, as my sewing machine is not super enough for the cartridge pleated bulk. So yes, there is actually a lot more work before the skirt is officially attached. Then hemming and putting guards on. So--kinda close to finished, and kinda not. ;-) Still nice to have a pic of what is starting be be a whole dress! As for the skirt split under the bodice: had to split it to get it on, but I don't like the gap. I will have to add some hook and eyes to close it once I'm in. And maybe a green panel behind so as to not indecently show my underwear! That's looking great! The lacings are so straight too! Very nice, congratulations Julie! I'm paying close attention to your adventures in cartridge pleating...thanks for all of the details. I bet once you hem it that'll cut down on the weight quite a bit. I hope anyway!